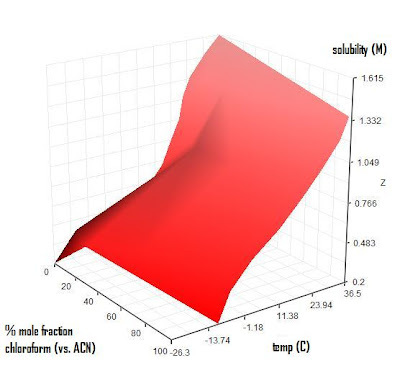 After a little bump in the road with attempting to measure the solubility of 4-nitrobenzaldehyde in methanol, Marshall Moritz extended the study (ONSC-EXP111) to chloroform and acetonitrile, where no hemiacetal can form. The sequential precipitation method seems to work quite well with a new thermostated bath that lets us go down to almost -30C. The values in pure acetonitrile and chloroform were consistent with those obtained from Maccarone, E.; Perrini G. Gazetta Chimica Italiana. 1982, 112, p. 447. (private access). But Marshall went further and measured 9 points with mixed solvents and different concentrations. The result is this saddle shaped 3D surface plot. I think the potential for extending the ONS Challenge to cover the full multi-dimensional space of mixtures of about 10 common solvents and temperature is very exciting. It would be foolish to think that we can map in extreme detail such large surfaces. However, I'll bet we can come up with some useful estimates of what the surface looks like in many areas of the space. The long rage plan for this approach would involve coming up with at least an empirical model based on molecular descriptors of the solvents and solutes. This would help predict the space for completely new combinations. Being able to predict the solubility of all starting materials and products would enable organic chemists to rationally select solvent systems and temperatures for their reactions maximizing product yield from simple precipitation. This is something that we are investigating for the Ugi reaction and I'll report on this as the data come in.